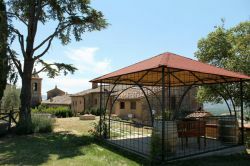 Villa Bel Giardino is just a few metres from the other two away, in a former medieval church, with huge terraced garden and private swimming pool. This place, surrounded by age-old olive trees, vineyards, huge rosemary plants and brooms may narrate thousand years of history. From here, guests can enjoy an enchanting view over the small village of Monte Antico amd the hilly, typical Maremma countryside, from sunrise to sunset. 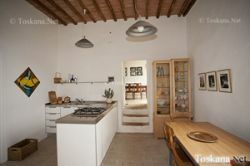 Villa Bel Giardino has approximately 210 sqm. of surface, subidivided over two floors and offering therefore comfortably space for 8 to 10 guests. 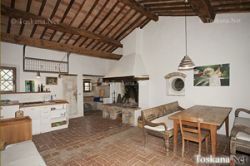 In the garden, the private pool, stone oven, tables and chairs for outside eating and sunbeds.